The cooking oil market in the GCC has been witnessing a major shift in investment patterns in recent years. Over the past decade, the investment in this market has doubled owing to players realizing the scope this market presents. The increasing population and a higher propensity of consumers to spend on edible oils are the primary factors driving the cooking oil market in the GCC. The presence of leading companies in the region has increased of late with the growth in demand. Improvisation and diversification of products in this market is a key strategy adopted by vendors. However, the high cost of raw materials required for the extraction of cooking oils is a major restraining factor for any new player in this market. The lack of local production of cooking oils due to adverse climatic conditions and less rainfall is another major factor limiting the scope of the GCC and Qatar cooking oil market. In terms of revenue, the cooking oil market in the GCC and Qatar was valued at US$988.2 mn in 2015 and is expected to reach US$1.7 bn by 2024, expanding at a 6.6% CAGR therein. In terms of volume, the market is projected to register a CAGR of 8.4% during the forecast period. On the basis of product, the cooking oil market in the GCC and Qatar is segmented into sunflower oil, corn oil, palm oil, and others. The others segment comprises soybean oil, flaxseed oil, and coconut oil, among others. Sunflower oil recorded a significant share in the cooking oil market, accounting for more than 70% in 2015. The segment is expected to lead the GCC and Qatar market throughout the forecast period owing to the widespread use of sunflower oil among residents in the GCC region. Despite accounting for a share of less than 7% in 2015 in the GCC and Qatar cooking oil market, corn oil is expected to grow at the fastest rate through 2024. By packaging type, the market is bifurcated into retail and bulk. Retail package emerged as the key contributor in the cooking oil market in GCC, accounting for more than 70% in 2015. Geographically, the GCC and Qatar cooking oil market is divided into Qatar and other GCC countries, such as Saudi Arabia, U.A.E, and Oman. The cooking oil market in Qatar is currently experiencing meager growth, with the arid region’s low population being the major restraining factor. Nevertheless, consumer spending in Qatar is likely to rise rapidly in the next few years, with the growth being centered on the food sector. The purchasing power of Qataris is higher compared to other GCC countries and coupled with the surge in healthy eating habits, the country is forecast to witness considerable growth in the cooking oil market. The cooking oil market in the rest of GCC has been experiencing steady growth and is expected to maintain a similar trend throughout the forecast period. The demand for several types of cooking oils is supported by the rising presence of expatriates from European countries such as Italy, Spain, and Greece. This trend is especially true for UAE, with Dubai being the most lucrative destination for market players. 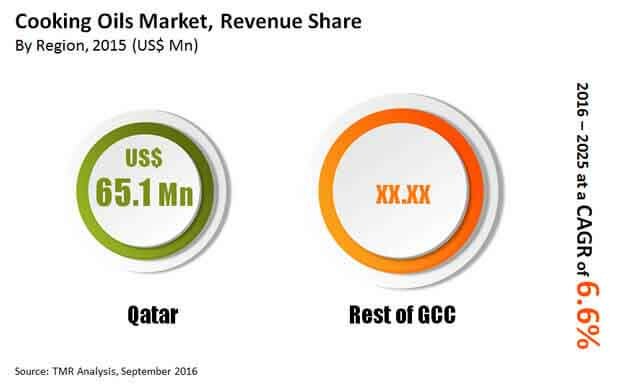 The leading players operating in the GCC and Qatar cooking oil market include Savola Group, United Foods Company, Asia Africa General Trading L.L.C, Hayel Saeed Anam Group and Co., Omani Vegetables Oils and Derivatives Co. LLC, and Al Ghurair Resources Oils and Proteins.